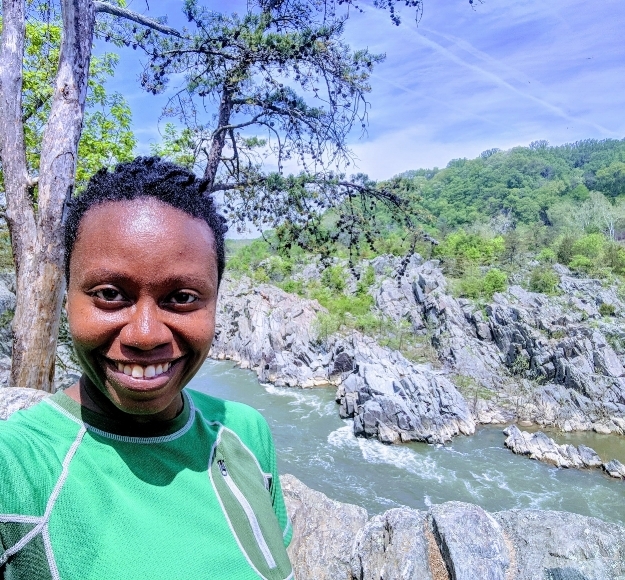 Me and the Potomac at Mather Gorge, Great Falls National Park, VA, just 20 miles from downtown D.C.
Until now, I’ve known only one river. I grew up on the south side of St. Louis, Missouri; practically on top of the Mississippi’s west bank. I moved away from home over twenty years ago and never really looked back, but, no matter where I am—the Twin Cities, New Orleans or 24,000 ft overhead—a sense of recognition and possessiveness rises up in me at the sight of its wide, dark bends. There’s nothing pretty about it, but the Mississippi is mine. It’s known to me. For years it was the only river I knew and it was a standard bearer for all others. For the first decade of my life, I assumed all rivers were the same murky brown. When I moved West, mountains monopolized my sense of wonder. First, I gave myself over to the breath-stealing ranges of Southcentral Alaska, then to those volcanic debutants of the Cascades: Mount Hood, Rainier, St. Helens. I was very far away from home, away from my family, and everyone who knew me before I was a fully formed adult. I was away from a sizable community of people who shared my history and culture. But my eyes were never starved for dramatic displays of beauty. I fully embraced an identity as a Mountain Person. I was convinced that the West had spoiled me forever. And maybe it did. It’s been a little over two years since I moved back East and I have better access to almost everything and everyone I missed while out West. But I still long for the mountains. Lately it's been my constant refrain. D.C. is great as cities go, I say, but I miss looking up and seeing something tall and breathtaking on the horizon that isn't the Washington Monument. Lately, though, I've begun to feel the lure of the Potomac. The more I explore the city’s natural surroundings, the more I realize how much the river—and not political pageantry—dominates the city’s landscape, its history, and its mood. All paths lead to the Potomac somehow. DC is not just a seat of government. It is part of a watershed; a metro area filled with glistening creeks and marshes that sustain ghostly deer, wild blue herons, and copperhead snakes. The Potomac carved Mather Gorge and left behind the sculpted rocks that hikers love to scramble across on the River & Billy Goat Trails. A spring morning at Rock Creek Park. Rock Creek is a nearly 33-mile tributary of the Potomac that flows from Montgomery County, Maryland, through northwest D.C. until it reaches the river at Georgetown. "Potomac" derives from the Algonquian word, "Patawomeck," which was the name of an indigenous tribe and village on the river's south bank. The native Piscataway, Powhatan, and Nanticoke people used the Potomac as a corridor of trade and travel long before the arrival of Europeans. For Africans and African-descended people, the river functioned as an entryway to slavery as well as an avenue of escape. During the Civil War, the river served as a physical boundary between the Union and Confederacy. Today, it is the Potomac that flows from our faucets and filters and nourishes us humans as well as the double-crested cormorants that roost above its waters. I moved to D.C. for the city’s embrace of its history, for the diversity, and the constant intellectual stimulation provided by free access to the Smithsonian museums. But for all the grandiose monuments, the Potomac is responsible for some of D.C.’s most flattering angles. 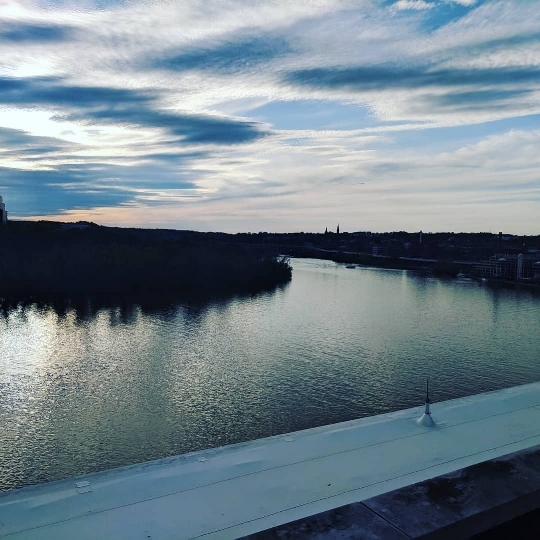 I think of how it looks at dusk from the terrace of The Kennedy Center, how it turns into a roaring phenom at Great Falls, how it inspires cheerful “good mornings” from bike commuters along the Capital Crescent Trail and wonder if it’s time to make room in my heart for another river. We can be friends, too. The Potomac River from the terrace of the Kennedy Center.